The blood, sweat and tears seen at Kanebridge Oval, were swapped for the glitz and glam on Club Champion Night at the Castle Hill RSL, as the East Coast Eagles celebrated 2017 and the year that was on and off the field. The occasion was enjoyed by a huge crowd, who were treated to a great night, filled with many deserving award winners and some great entertainment from the award winning Australian comedian Marty Fields, who put on an entertaining performance that left the crowd in stitches. The night began with major sponsors Vesta Homes and Mansfield Corporation being awarded their signed jumpers and committing to football club long-term. To truly kick off the night in appropriate fashion, the club celebrated the induction of a new life member with Phil “Philby” Bester being awarded for his outstanding service to the football club, over an extended period of time. Philby made it known that whilst he’s a Carlton Blue for life, the Eagles are his second family, and remains incredibly proud and honoured to become an East Coast Eagle life member. Before the team honours were awarded, the crowd heard from incoming head coach Lindsay Scown, who spoke of his motivation and willingness to return the club to the finals in 2018 and kickstart East Coast’s new era in successful fashion. Lindsay also announced the 2018 East Coast Eagles coaching staff: Prems: Lindsay Scown, DIv 2: Matt O’Connor, Div 4: Michael Lambert, Under 19’s: Peter Van Vliet, Eagals: Phil Bester. 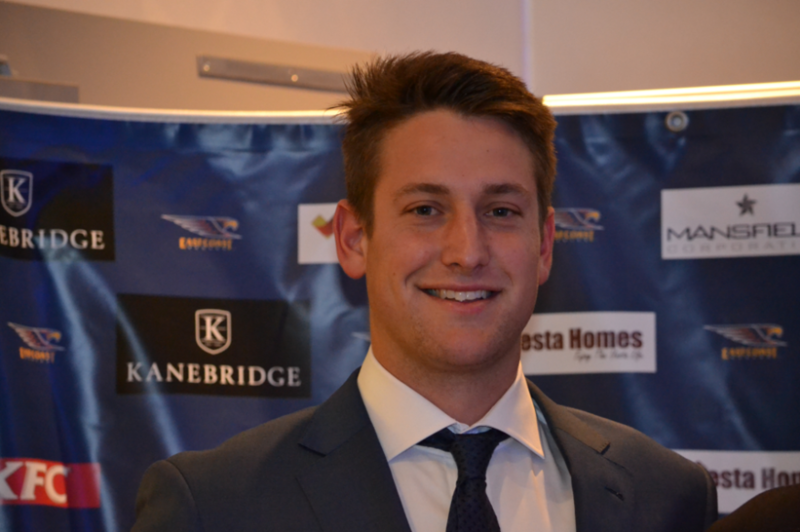 Now for the team awards, and our Division Four best and fairest was, won by Benjamin King. King capped off a very good year (his first full season as an AFL footballer), in which he proved his capabilities of playing anywhere across the ground at a high quality. For Division Two, Daniel O’Connor was the worthy recipient of the Billy McLeod Medal. ‘Doc’ had an extremely consistent year through the midfield and off half-forward, again showing why he has scooped many awards since his career at East Coast began. 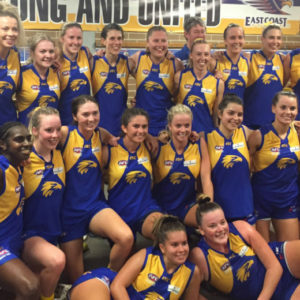 Next, and in 2017 the East Coast Eagles welcomed a women’s team for the very first time along with an Under 18s women’s side. On the night, the first ever women’s Best and Fairest Medal was awarded to captain Sarah Ford after playing her first ever season of AFL football. 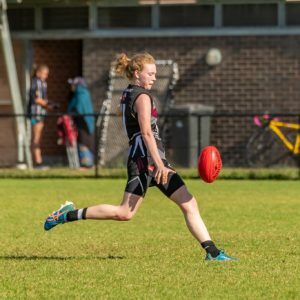 It was also mentioned that Sarah finished second in the Women’s league best and fairest award; which in itself is an outstanding achievement. 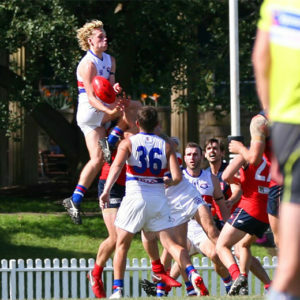 It was a changing of the guard of sorts at the Eagles in 2017, in the sense that, the Under 19s made the finals after years of slim results; standing as the sole male team to play finals footy this season. Daniel Saywell was awarded the Trevor Hangan Medal as the Best and Fairest, who had an excellent season helping guide the side to finals football. 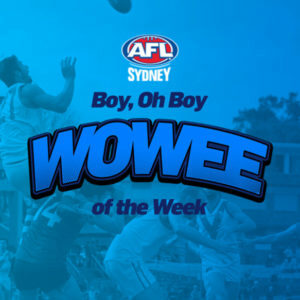 Daniel also managed one Prems game, in which he played a heavy hand in the Eagles’ 1 point upset of table topping Sydney University. Saywell, among other Under 19s Eagles certainly have a strong future at the football club. Volunteer of the Year- awarded to both Ron and Barbara Heathcote for the fabulous food prepared on a weekly basis on the custom-made BBQ. Clubman and Club Person of the Year- was awarded to Scott Waterhouse and Will Cashmore respectively, who were honoured for the outstanding extra efforts, they put into the club each and every week. President’s Award- deservedly awarded to Richard and Colleen Lee who have managed and run the catering and canteen religiously for the last 3 years. Finally, the 2017 East Coast Eagles Club Champion count concluded with workhorse and hardman midfielder Stuart Turner finishing the clear winner and deserved Peter Physick Medallist, after falling short as runner-up in 2016. Turner capped off a brilliant season where he was rewarded with his first Peter Physick Medal for club best and fairest. His performances throughout the season saw Stuart play with heart and passion, he was a major possession winner for the Eagles in 2017. Turner was extremely humble in his acceptance of the award, speaking of his pride in representing himself and his family, and also his commitment to giving absolutely everything he could for his beloved Eagles jersey. Turner finished the favourable winner over fellow superstars: runner up and 2016 Peter Physick Medallist Kieran Emery, as well as Mark Weekes and Aaron Drinkwater. AFL footballers come none tougher the Stuart Turner and everyone in the East Coast Eagles community congratulate Stuart on his efforts in 2017.